In order to make any further progress, we need to determine the relationship between the Sun's internal pressure and density. Unfortunately, this relationship is ultimately controlled by energy transport, which is a very complicated process in a star. In fact, a star's energy is ultimately derived from nuclear reactions occurring deep within its core, the details of which are extremely complicated. This energy is then transported from the core to the outer boundary via a combination of convection and radiation. (Conduction plays a much less important role in this process.) Unfortunately, an exact calculation of radiative transport requires an understanding of the opacity of stellar material, which is an exceptionally difficult subject. Finally, once the energy reaches the boundary of the star, it is radiated away. The following ingenious model, due to Eddington (Eddington 1926), is appropriate to a star whose internal energy transport is dominated by radiation. This turns out to be a fairly good approximation for the Sun. The main advantage of Eddington's model is that it does not require us to know anything about stellar nuclear reactions or opacity. the radiation pressure (assuming that the radiation within the Sun is everywhere in local thermodynamic equilibrium with the plasma). Here, is the Sun's internal temperature, the Boltzmann constant, the mass of a proton, and the relative molecular mass (i.e., the ratio of the mean mass of the free particles making up the solar plasma to that of a proton). Note that the electron mass has been neglected with respect to that of a proton. Furthermore, , where is the Stefan-Boltzmann constant, and the velocity of light in a vacuum. Incidentally, in writing Equation (13.26), we have expressed in the equivalent form . It can be seen, by comparison with Equation (13.4), that the previous pressure-density relation takes the form of an adiabatic gas law with an effective ratio of specific heats . Note, however, that the actual ratio of specific heats for a fully ionized hydrogen plasma, in the absence of radiation, is . Hence, the exponent, appearing in Equation (13.30), is entirely due to the non-negligible radiation pressure within the Sun. 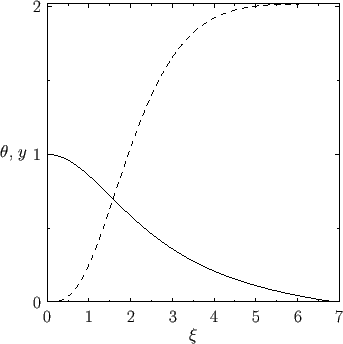 Figure: The functions (solid) and (dashed). Figure 13.2: Solar temperature versus mass fraction obtained from the Eddington Solar Model (solid) and the Standard Solar Model (dashed). Equation (13.40) is known as the Lane-Emden equation (of degree ), and can, unfortunately, only be solved numerically (Chandrasekhar 1967). The appropriate solution takes the form when , and must be integrated to , where . Figure 13.1 shows , and the related function , obtained via numerical methods. Note that , and . 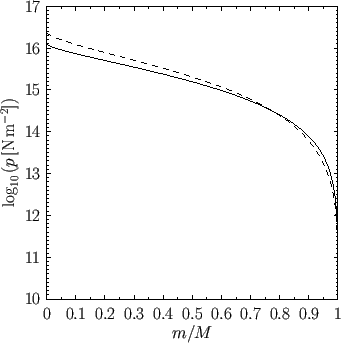 Figure 13.3: Solar mass density versus mass fraction obtained from the Eddington Solar Model (solid) and the Standard Solar Model (dashed). Using the observed solar mass , and the value (which represents the best fit to the Standard Solar Model mentioned in the following), we find that . In other words, the radiation pressure inside the Sun is only a very small fraction of the gas pressure. This immediately implies that radiative energy transport is much less efficient than convective energy transport. Indeed, in regions of the Sun in which convection occurs, we would expect the convective transport to overwhelm the radiative transport, and so to drive the local pressure-density relation toward an adiabatic law with an exponent . Fortunately, convection only takes place in the Sun's outer regions, which contain a minuscule fraction of its mass. 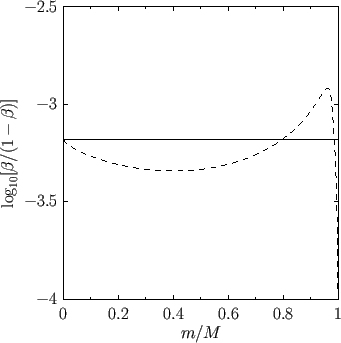 Figure 13.4: Solar pressure versus mass fraction obtained from the Eddington Solar Model (solid) and the Standard Solar Model (dashed). where the solar radius has been given the observed value . The actual values of the Sun's central temperature, density, and pressure, as determined by the so-called Standard Solar Model (SSM),13.1which incorporates detailed treatments of nuclear reactions and opacity, are , , and , respectively. It can be seen that the values of , , and obtained from the Eddington model lie within a factor of two of those obtained from the much more accurate SSM. Figures 13.2, 13.3, and 13.4 show the temperature, density, and pressure profiles, respectively, obtained from the SSM13.2 and the Eddington model. The profiles are plotted as functions of the mass fraction, , where . It can be seen that there is fairly good agreement between the profiles calculated by the two models. 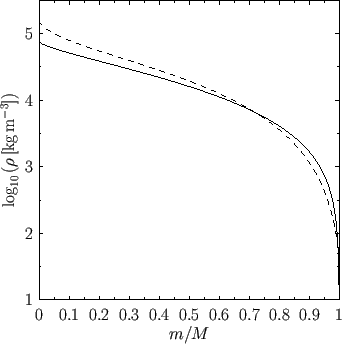 Finally, Figure 13.5 compares the ratio, , of the radiation pressure to the gas pressure obtained from the SSM and the Eddington model. Recall, that it is a fundamental assumption of the Eddington model that this pressure ratio is uniform throughout the Sun. In fact, it can be seen that the pressure ratio calculated by the SSM is not spatially uniform. On the other hand, the spatial variation of the ratio is fairly weak, except close to the edge of the Sun, where convection sets in, and the Eddington model, thus, becomes invalid. We conclude that, despite its simplicity, the Eddington solar model does a remarkably good job of accounting for the Sun's internal structure. 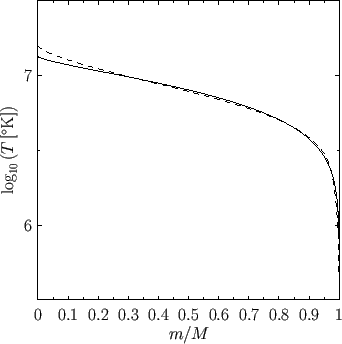 Figure 13.5: Ratio of radiation pressure to gas pressure calculated from the Eddington Solar Model (solid) and the Standard Solar Model (dashed).